Aerial Threat (10 points) : Score a header with a player with the Aerial Threat Speciality. Against the Odds (10 points) : Win a Head to Head Ranked Match using a weaker team. Always Friendly (10 points) : Cross for a Friend to score. Around the World (25 points) : Play a match with a team from every league. Back of the Net (5 points) : Score 5 goals in one Arena kick-about. Club Glory (25 points) : Win the Cup as part of an online Pro Club. Eat My Goal (5 points) : Upload a Video to EA SPORTS Football World. Established Keeper (50 points) : Play a season as a Goalkeeper in Career Mode. First Time Out (10 points) : Win an online Friends League match. Folklore (25 points) : Become a Legend as a player in Career Mode. Founding Member (25 points) : Include a Creation Centre Team in a Kick-Off match. Good Form (20 points) : Play 5 consecutive Head to Head Ranked Matches without losing. Home & Away (50 points) : Play & win in every Stadium. Home Maker (5 points) : Change the Home Stadium of any team. Hundred & Counting (100 points) : Play 100 Head to Head Ranked Matches. In the Game (5 points) : Create a Virtual Pro. Look at me! (25 points) : Download your Game Face from EA SPORTS Football World. Mastermind (10 points) : Have a substitute score a goal in Career Mode. Once in a lifetime (10 points) : Score as the Goalkeeper in any match. One Club Man (50 points) : Play 50 matches for the same online Pro Club. One to Remember (5 points) : Save a highlight to the Replay Theatre. 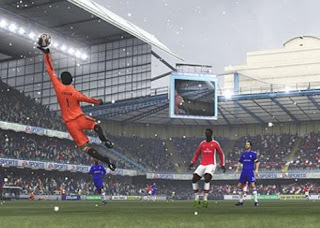 Picture Perfect (5 points) : Upload a Screenshot to EA SPORTS Football World. Playmaker (10 points) : Create a goal with a player with the Playmaker Speciality. Record Holder (25 points) : Get your name on any Career Mode Leaderboard. Rising Talent (25 points) : Complete 100 Accomplishments with your Virtual Pro. Safe Hands (10 points) : Play any match as the Goalkeeper with no Assistance. Team Training (10 points) : Play a Practice Match with your online Pro Club. Training Time (5 points) : Work on your skills in any Arena Practice Mode. Virtual Football (25 points) : Play a Pro Clubs match as a team of 10 or more. Virtual Legend (100 points) : Play 500 matches with your Virtual Pro. Warming the Gloves (10 points) : Make 10 saves in 1 Arena kick-about. Woodwork & In! (10 points) : Score off the post or cross bar in a match. Good Week! (15 points) : Get yourself selected in the Team of the Week in Career Mode. Great Month! (25 points) : Win the Manager of the Month award in Career Mode.